Sharon Haun's first-person interpretation will tell story of last years of Eliza Huffaker's life at Kaw Mission. 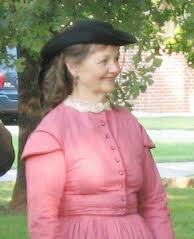 Historical interpreter Sharon Haun will present a first person interpretation, "Eliza Huffaker Returns to the Kaw Mission," in the seventh presentation of the Kaw Councils 2011 educational program series at 2 p.m. Sunday, Oct. 23, at Kaw Mission State Historic Site, 500 N Mission Street, in Council Grove. The Kaw Mission was built in 1850-51 by the Methodist Episcopal Church South to expand the work at the Shawnee Mission in Kansas City, where young American Indian boys were taught to farm. In May of 1851 headmaster Thomas Johnson sent a young teacher, Thomas Huffaker, to the Kaw Mission to teach Kanza boys who were living on a reservation surrounding Council Grove. Single and 26 years of age, Huffaker took a fancy to the hired housekeeper's fifteen-year-old daughter, Eliza Ann Baker. Huffaker and Eliza were married May 5, 1852, upstairs in the southeast room of the mission. The Huffakers continued to reside in the mission until 1862, when they moved into a new and larger house that would eventually accommodate their 10 children. Soon after the turn of the century, Thomas and Eliza moved back into the Kaw Mission. Thomas died there July 10, 1910. Ten years later, Eliza passed away in the same room where she and Thomas were wed.
Haun's portrayal finds Eliza in the last years of her life while moving back to the Kaw Mission. Site administrator Mary Honeyman will present a short history of the Kaw Mission as an introduction to Haun's interpretation. A native to Morris County, Haun has spent her adult years living in Council Grove. Her love of history led her from serving as a tour guide to participation in the Voices of the Wind People historical pageant to working as a volunteer on the Morris County Historical Society archives. After many years portraying Eliza in pageant performances, Haun currently serves as the head of the Voices committee. The Friends of Kaw Heritage, Inc. (FKH) and the Kansas Historical Society sponsor Kaw Councils 2011 and provide free refreshments for the event. Kaw Councils 2011 is open to the public for the price of the regular admission fee to the mission. For information, contact the mission at 620-767-5410, kawmission@kshs.org or visit kshs.org or www.friendsofkawheritage.org.